A few weeks ago I said that I would make an Easter cake for the office to raffle off for charity. I hadn’t decided what cake I would make so I used my usual source of inspiration – Pinterest. However, none of the Easter ideas I’d pinned last year jumped out at me so I decided to have another search. I was looking for ideas rather than something to copy completely but after I saw this cake I decided that there wasn’t much about it that I wanted to change. We wanted to sell raffle tickets the day before so I made the decorations and took some photos of them so that people could see what it was going to look like. 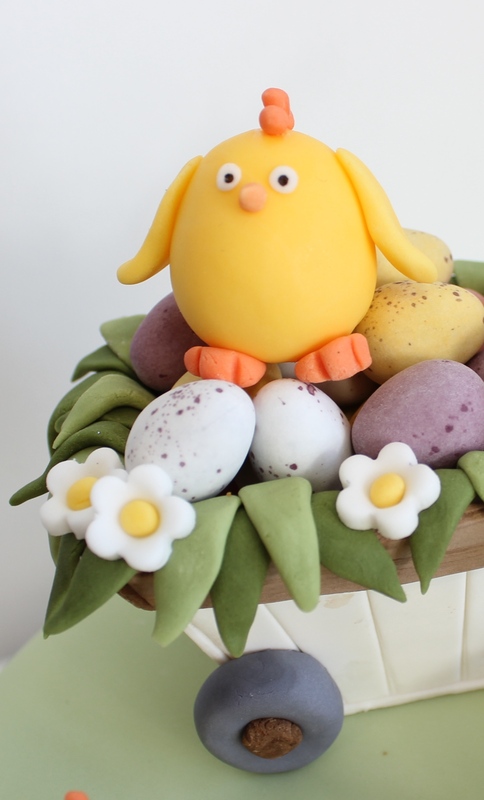 The chicks were super quick to make – I made egg shapes out of fondant icing for the bodies and then made the eyes, beaks etc (also out of fondant) and stuck them on using a drop of water. The flowers were cut out using a small flower plunge cutter and then I stuck a small ball on fondant into the middle of each one. 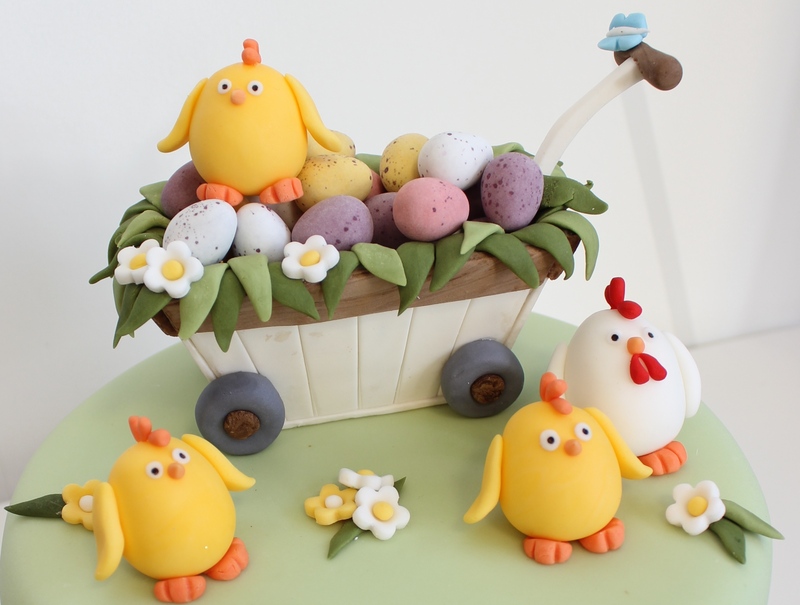 The cart was made out of sugar florist paste so that it would set hard quickly. I cut the 4 sides out separately and used a knife to make the indents so it looked like it was made from slats. I cut out a piece for the base too and then stuck them all together using edible glue – I held them in place with some food colouring pots while they dried out. I made the wooden rim out of brown sugar florist paste – I didn’t blend the colouring in completely so that it had a marbled/wood effect. I stuck strips on to the top of each side of the card. The handle was also made of sugar florist past and I left it to dry completely before I stuck it on so that it held its shape. I made the rest of the cake and iced it last night. After a couple of requests I decided to make the chocolate caramel ombre cake from the BBC Good Food website. I’d made it for Wendy in the office a few months ago for her 60th birthday and although I didn’t get to try it everybody said it was delicious. I’ve still only tried the off-cuts but I can confirm it was very tasty. The cake is covered in ganache rather than buttercream which actually made it easier for covering in fondant. However, if was I was making it in the summer I would probably have adjusted the ratio of chocolate to cream to add more chocolate to make it set firmer. It’a also 4 layers tall so it was slightly bigger than than a standard cake. I covered the whole cake and board in green fondant icing and then rolled out white fondant to cut out a fence and gate – I cut out a strip that was about 5cm wide and then used the pointed end of a heart cutter to cut out triangles. I then cut it up into strips so that I had lots of fence posts with pointed ends. 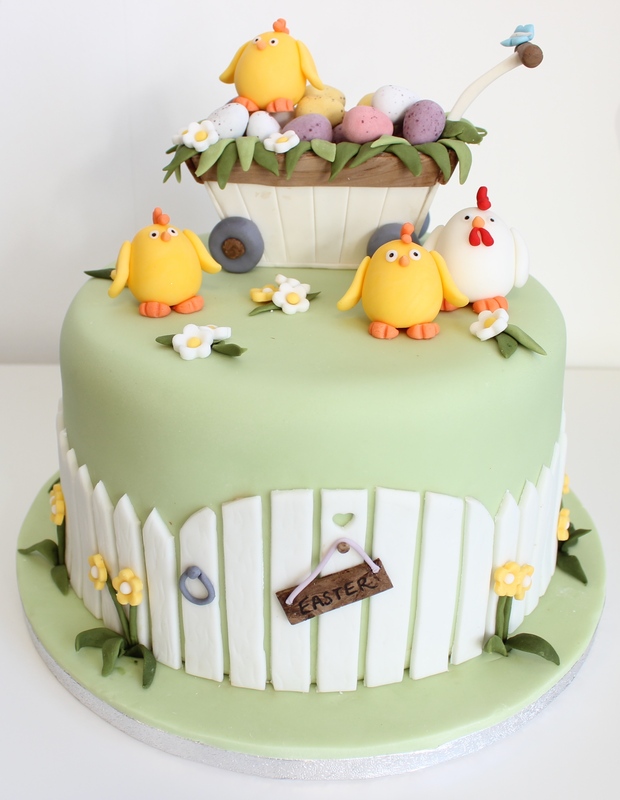 Now I just need to find a cake to make for us this weekend – I think it’s going to be hard to beat this one!